2/22/19 Started Zinnia angustifolia inside – 3 seeds per cell. Also testing fiber cells. 4 day germiantion! 2/20/19 Start thyme – mother with and w/o vermiculite on top. 8/15/18 Tried Milo on yellowing salvia. Two weeks later the salvia is dark green. 8/1/18 Cut Threadleaf coreopsis back by half to encourage blooming. Sept. 5 – cut back portion has not bloomed. The other side is blooming slightly. 8/1/18 Cut Pearly Everlasting to ground – will it come back? No – there do seem to be buds in other areas. 5/29/18 Rudbeckia fulgida fulgida – dug it up with a big ball of dirt vs using small pots of it I dug up. It seems to be best if you let the seedlings grow to fist size, then dig them up with a clump of dirt and move them to their permanent location. 3/30/2018 Allium – separated and put in cells outside 2 weeks ago. They seem to be doing ok – even in 29 degree weather. 3/30/18 Test Burnout vs Vinegar Burnout is MUCH better. 3/30/2018 Added Osmocote to the top of some plants – will it help? NO – plants seemed to die. 3/20/18 Planted gomphrena – 85 degrees with bottom heat versus 78 degrees no heat. Bottom heat is only slightly better. Almost all the seeds germinated. 3/4/18 Planted Tropical MW seeds inside 3/20 – 90% germination in both trays with heat underneath. 2/27/18 Divided allium and left them outside. They seem to be fine – even under the snow. I also put them around the mailbox area. Feb 23, 2017 Gibberellic acid – will it aid germination of different milkweed species? Soaked some for 24 hours. Mainly no difference, except for Common MW – I got 4 seeds to germinate. Sept 15 2016 Planted red clover and annual rye – they germinated well. Will they over-winter? Note – Temp on Dec 18th – 4 degrees Feb 2017 – both plants have overwintered. I need to trim rye grass. 9/16/2016 Cut seed pods off Allium Millenium – will it keep blooming? NO, but it still blooms a long time. 9/16/2016 I cut back Profusion Zinnia to the ground because it was dying. It did not come back. Best results are 80 degrees and seed covered. Seed shown germinated in five days using Pro-Mix. It doesn’t seem to make any difference if the seeds are on top or covered. Jan 21, 2016 Moving seeds with leaves, but no TRUE leaves and putting them in 6 pack to see if they will transplant. Covered with plastic top. They moved without any problem. Aluminum can developed some roots – not as many as I’d like – plain glass did not develop roots. Aug 10 Planted more buckwheat in gardens by house in bare areas – I did not cover this. Does not germinate – needs dirt on top. Aug 4 Planted buckwheat in front garden – slightly covered with soil. Plants have germinated well. July 10 Roundup alternative – 1 gal vinegar + 1 cup Dawn + 1 cup table salt. Kills small plants, but larger weeds it only kills the tops and they come back from the root. July 6 Planted Trop. MW seeds in front. Seeds buried in the area by the Phone Line box and seeds not buried in the center garden. 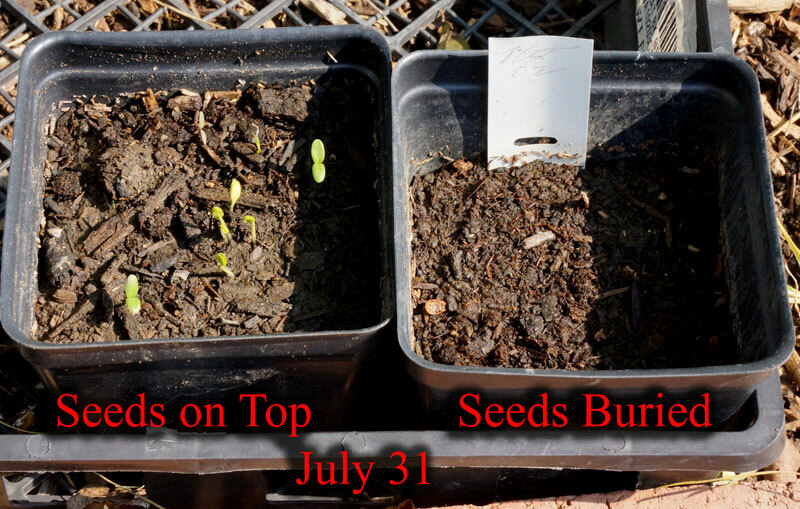 Aug 5 – seeds are only about two inches high. May-June I cut back the New England Aster to 18″on May 1 and June 1. Plants still have gotten tall. These are aggressive growers. 2015 Test different weed/grass killers – 100% vinegar + dish detergent + oil – article 1 – Nature’s Avenger – also Ammonia – Regular vinegar kills small young weeds – I usually spray two days in a row. It will not take down mature weeds. 3/14/15 Pro-Mix versus Miracle Gro Organic and test Osmocote on top of soil versus in the soil. 3/9/15 1. Spray Poa annua with 5% Vinegar – it’s still cool. so I’m not sure if this will work. 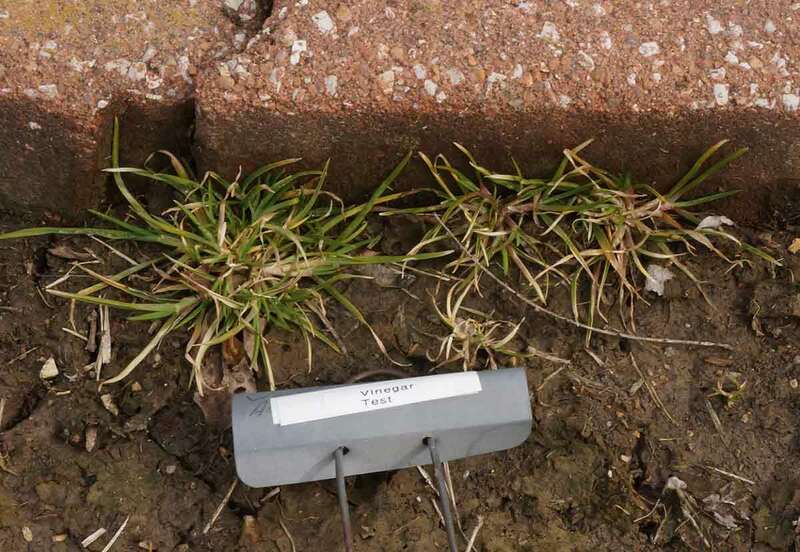 3/11 – I can see definite damage to the plants – sprayed again, but also included all the edging areas. 2. I added 4 oz Murphys Oil Soap to 28 ounces of plain Vinegar. 3. Note – I found Cleaning Vinegar at Home Depot. It does not state the percentage, but the MSDS says approximately 5% – how is this any different then plain vinegar? 1. Does ok on the Poa, but will need two or more applications – other weeds are not affected or will take multiple applications. 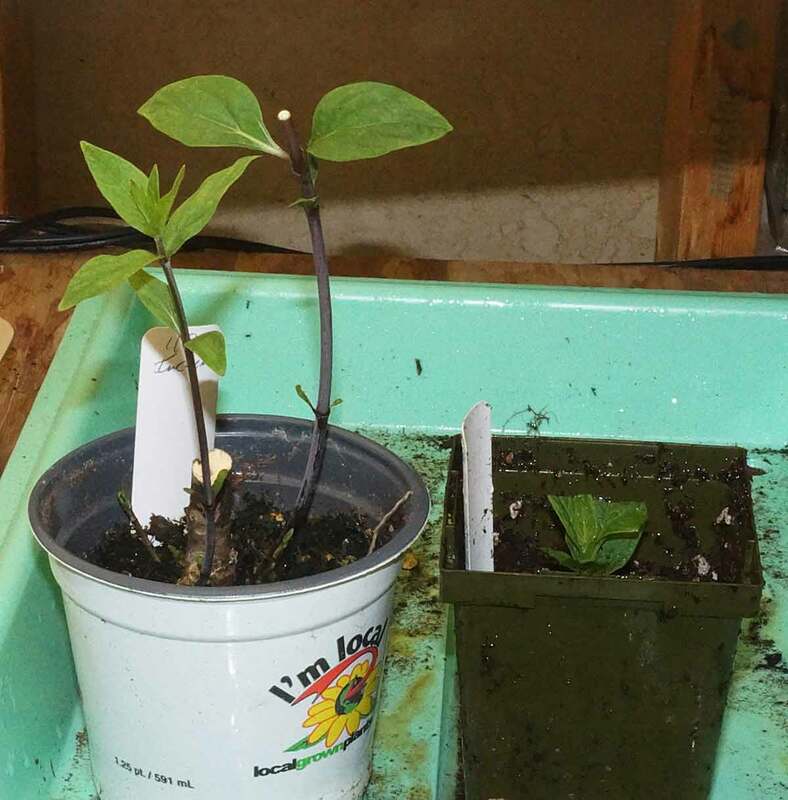 2/27/15 Start tropical milkweed – one with bottom heat and one without. Both have a shop light on top of them. 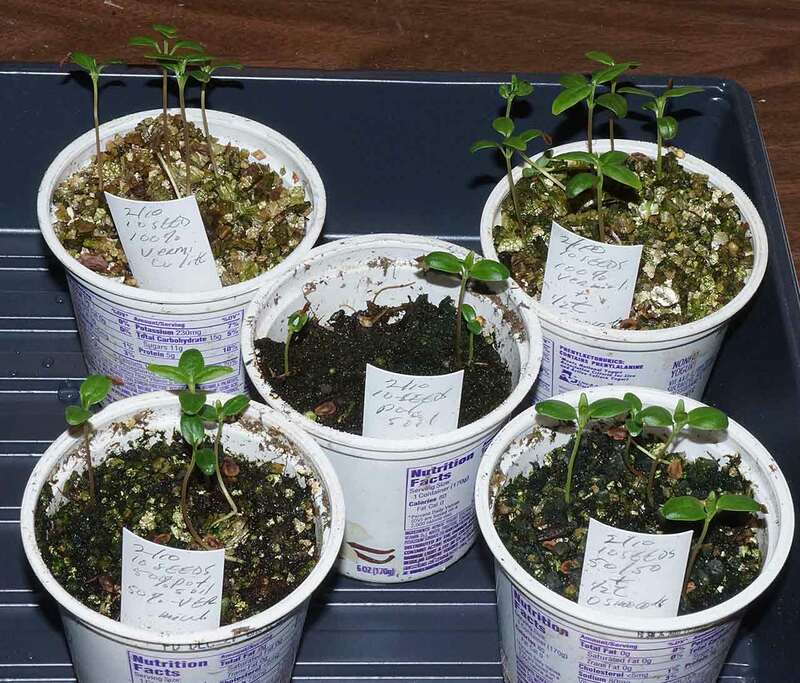 Bottom heat wins – right now I’ve got 40 plants in the bottom heat and none on the other. 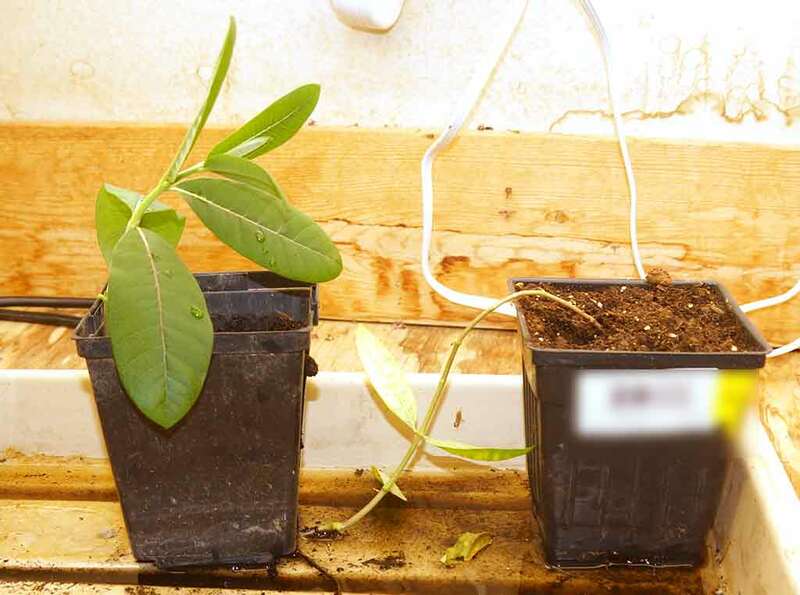 2/19/15 Soak milkweed seed in 190 degree water for 12 hours before planting – they also mention doing this three times for a 50% germination rate. I’m going to give this a try with Incarnata, Hop Tree and Echnacea. March 14 – nothing is germinating. 2/17/15 I’m checking to see if Asclepias incarnata will root from cuttings using my standard method. Yes – it’s doing well – I’ve taken a 2nd cutting also. 2/10/15 Testing different type of potting medium to see how it affects germination. I’ve had good luck with vermiculite in the past and I’m testing that versus 50/50 mix vermiculite/potting soil and also a version with Osmocote+. 2/9/15 As I clean the gardens, I am digging up some plants, anise hyssop, and putting them in pots, but leaving them outside. I wonder how they will do? After I set these plants out the weather has turned extremely cold in February. Hyssop did survive! 1/23/15 Started Ech. paradoxa inside – seeds are VERY tightly packed on the seed head. According to PrairieMoon, this species is used to hybridize with other Echinacea species. Theory – if this germinates, then I can plant it all over the garden and come up with my own species? ZERO Germination! 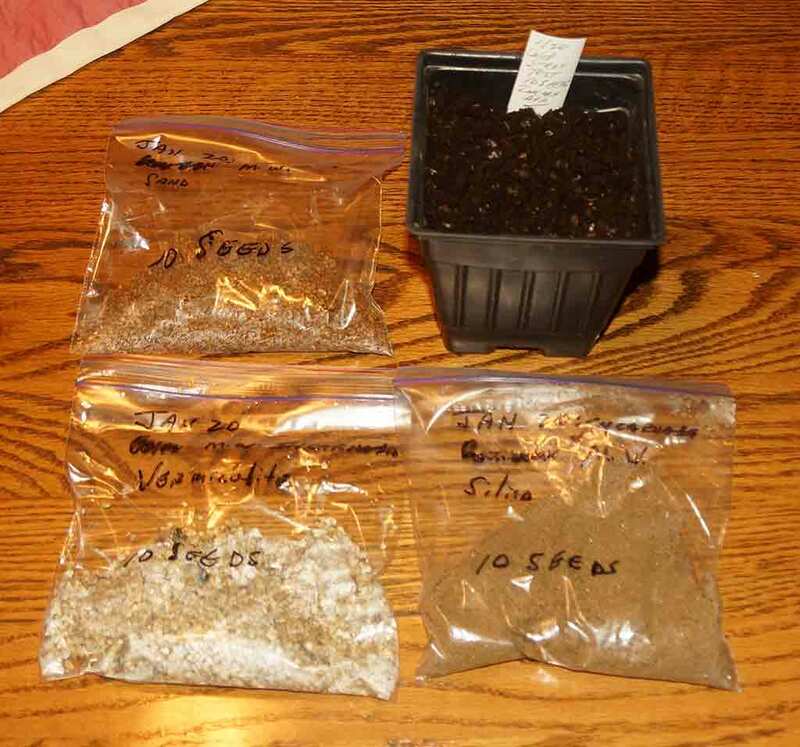 1/20/15 Cold Stratification Tests 30 days – silica sand, regular sand, vermiculite and one pot of potting soil. 1/3 cup of each + 2 tsp of water. Left outside instead of refrigerator. I did put some seeds in the refrigerator to see if there was any difference. Note – I also started some seeds inside where it’s warm also.Feb. 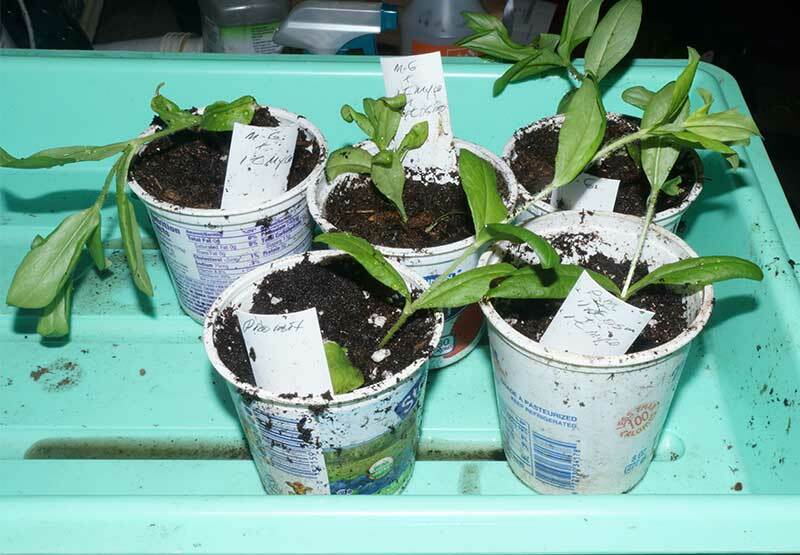 26th – brought seeds inside and planted them. Note – from my class at SNR – 1 month is too short a time. 3 months would be better. 1/18/15 I am starting the process of cleaning up my beds and one of my coreopsis had some small green sprigs on its long arms. I wondered if these would root and give me new plants if I planted them?I got about 14 possible new plants. 90% of these plants seem to be living. 1/19.15 Can I get common milkweed to root via layering the stem in soil? 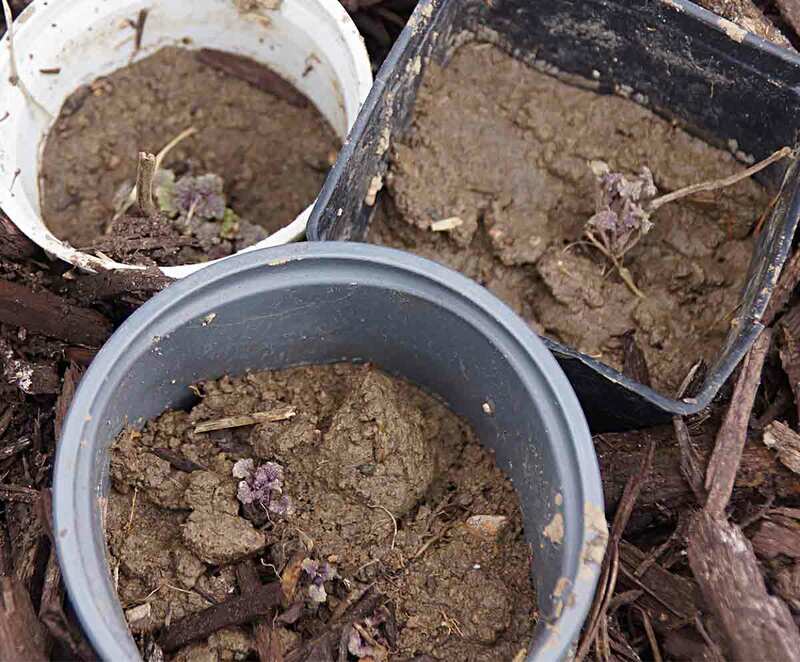 9/9/14 Test 05 – Planted Common Milkweed in 6 pack containers on top of soil.From Everwilde – says it doesnt need cold stratification. 2 or more seeds per cell. I tested 36 seeds and only got 2 to live. These might be better off germinating outside. 8/3/14 Test 04 – Some Incarnata is looking terrible and looks as if it’s dying. – I dug it up, cut off the tops, split it and put it in pots in water. Other plants in the area have died. Results -Most of the plants survived and are doing better. 7/23/14 Curassavica – brand new seeds – seem to be germinating on the ground. Testing new seeds on top of soil vs seeds planted under soil. 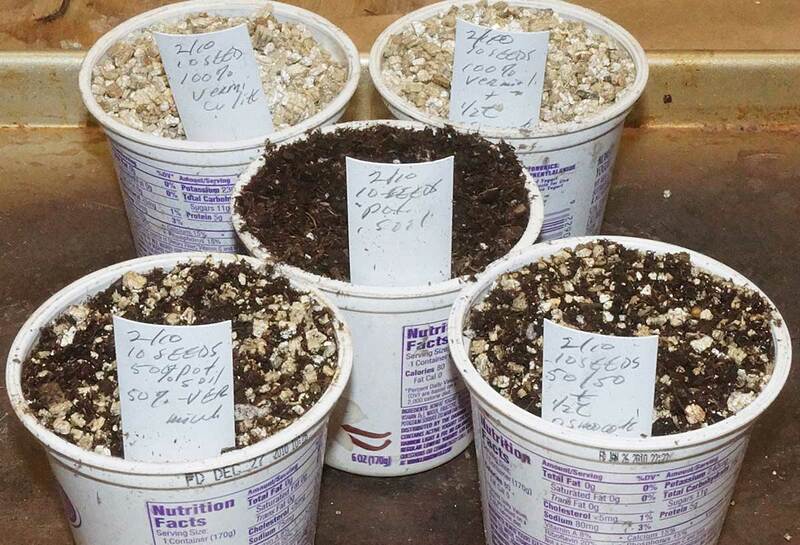 Seeds on top of the soil germinate in approximately one week – very amazing. These are brand new seeds taken from growing plants. 7/15/14 Test 001 – Cut down New Eng Aster to ground – will it come back and when? 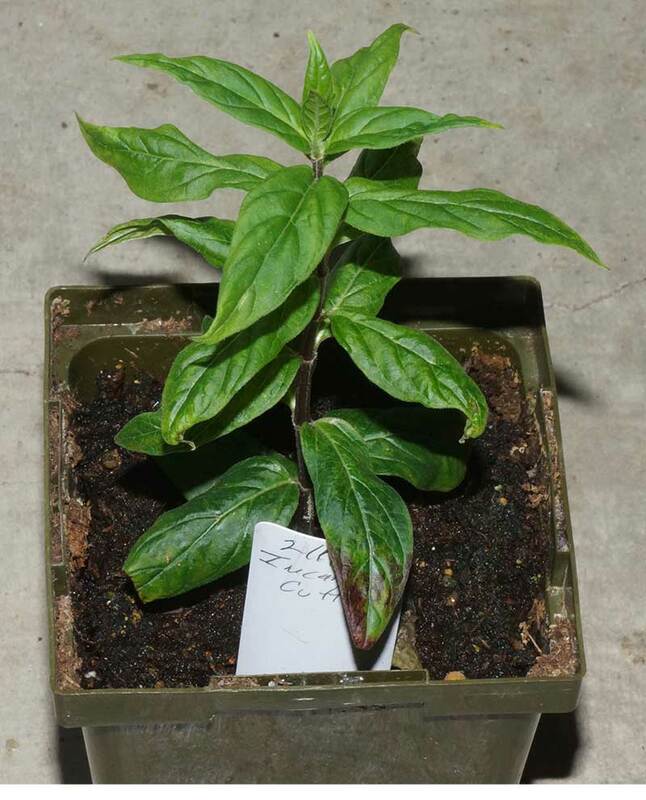 Aug 2 – plant is only 1″ off the ground.Sept 10 – plant is about 12″ tall, no blooms. Most of the other NEA is just starting to bloom.Conclusion – 7/15 is too late to cut to ground. Only cut back part way. 7/8/2014 Cut Daisy May to ground, it was done blooming – it bloomed all at once, and added some fertilizer – I wonder how it will come back? Plant is coming back – Sept 10 plants are starting a 2nd bloom – low grower.